A recent, interesting launch by Epson – a new dye-sublimation textile printer, the 1.6m-wide SureColor SC-F9300. This new roll-to-roll printer is an upgraded form of the SC-F9200 model, and is set to replace it. According to Epson’s sales manager Phil McMullin, the main improvement on the new machine is a new feed mechanism that helps avoiding cockling on thin substrates of minimum 40gsm, plus a few speed improvements. The new printer can reach maximum speeds of up to 108.6sqm/hr, more than 10sqm/hr faster than the F9200, at a maximum resolution of 720×1,440dpi. It has an improved color gamut, a large diameter friction roller for accurate media feeding, a new printhead guard and Oeko-Tex Eco Passport certification. 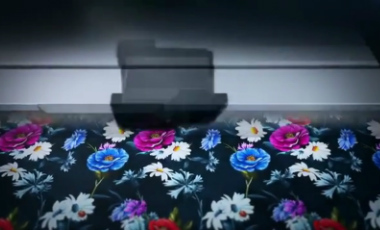 The main marketplace for the new machine is in the textile printing hubs of Italy, Spain, Turkey, and many other places and industries that can use and benefit from textile wide format printing. One of the key developments in their S series of signage printers was the feed mechanism. That proven feed mechanism was duplicated and used in the F9300. The SC-F9300 will be launched in the UK at next month’s Print Show in Telford.